We were just as horrid any other bunch of kids, but I don’t believe this holiday threat was known to my mom. The one I remember best was, “If you kids get up before the sun is up, no presents”. I can still remember the torture of my brothers and I staring out the window, at the houses behind our house, waiting for that first glimmer of light. It was an eternity to us. I was a feisty and dramatic little girl who was prone to temper tantrums. I can only imagine my wrath if my stocking was filled with only coal. 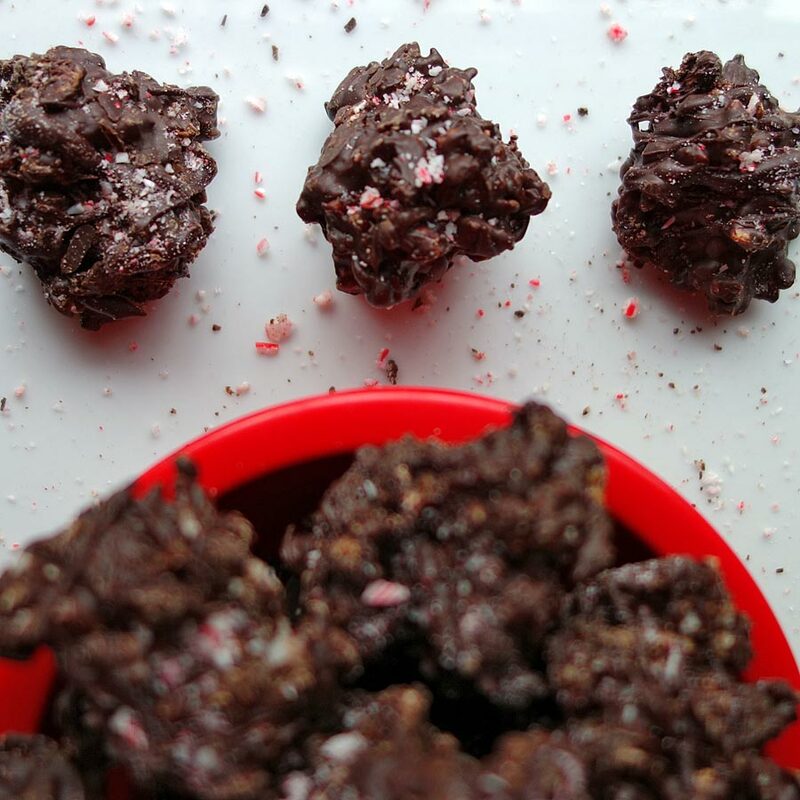 Chocolate Peppermint Coal Clusters are perfect for the parents who threaten coal since they look like coal. I wanted to make a crunchy chocolate cluster with the flavors of Christmas since I’d already made Maple Sugar and Pink Salted Cranberry Orange Walnut Chocolate Clusters for Thanksgiving and they were a hit. I was slightly stumped on what to put in them besides candy canes and rice when I came up with the idea to make my own peppermint patties. 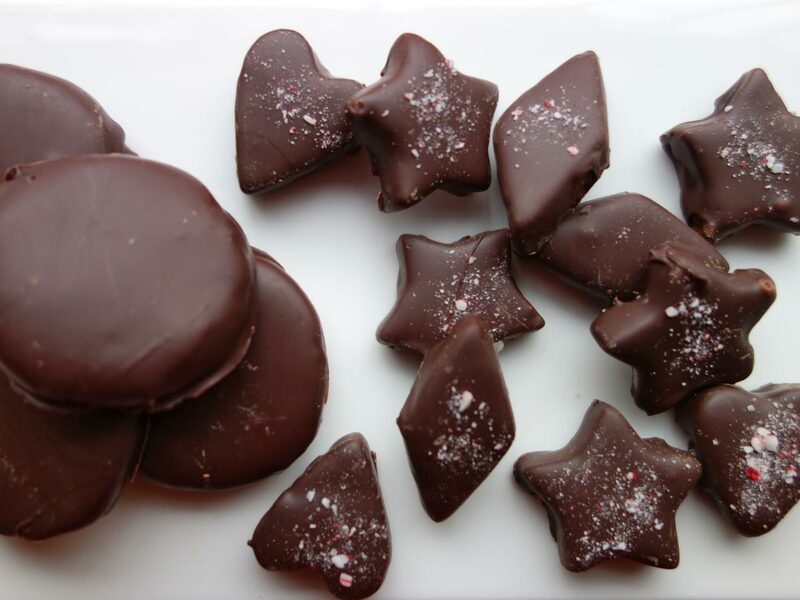 Creamy peppermint centers, dipped in chocolate and they’re vegan to boot! In a medium bowl, using a hand mixer, blend together sugar, coconut oil and peppermint oil. For shapes: Press mixture between two sheets of waxed paper and roll to 1/4” thickness. Freeze for 1/2 hour. Cut with a cookie cutter. For rounds: chill mixture for 1/2 hour, then roll into preferred sized balls and flatten into patties. Dip in chocolate. Drizzle with chocolate to garnish. Yield: Yield depends on the size of the patties. Peppermint extract is not as powerful as peppermint oil. You can substitute, but the flavor will not be as minty. Another garnishing option is to sprinkle the patties with crushed candy cane before the chocolate hardens.